Acknowledged author Alan Agresti wrote Statistical Methods for the Social Sciences comprising 608 pages back in 2017. Textbook and etextbook are published under ISBN 013450710X and 9780134507101. 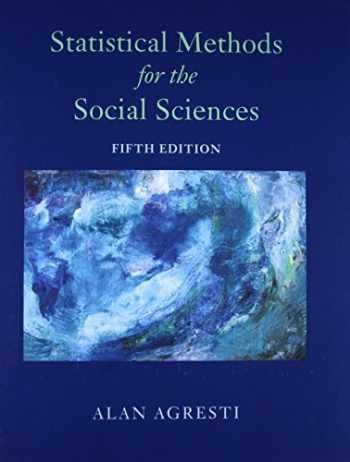 Since then Statistical Methods for the Social Sciences textbook received total rating of 4 stars and was available to sell back to BooksRun online for the top buyback price of $65.10 or rent at the marketplace. For courses in Statistical Methods for the Social Sciences . Statistical methods applied to social sciences, made accessible to all through an emphasis on concepts Statistical Methods for the Social Sciences introduces statistical methods to students majoring in social science disciplines. With an emphasis on concepts and applications, this book assumes you have no previous knowledge of statistics and only a minimal mathematical background. It contains sufficient material for a two-semester course. The 5th Edition gives you examples and exercises with a variety of “real data.” It includes more illustrations of statistical software for computations and takes advantage of the outstanding applets to explain key concepts, such as sampling distributions and conducting basic data analyses. It continues to downplay mathematics–often a stumbling block for students–while avoiding reliance on an overly simplistic recipe-based approach to statistics.